Are you aware of the fact that you can increase your website’s organic traffic very fast by using your competitor’s keywords? A keyword is a phrase or a word that highlights a topic of significance within your web content. And the main purpose of using it is to enhance the value of the content for search engines and visitors. Now, you might be wondering about the various techniques to find competitor’s keywords that have little competition but helps to get huge traffic to the site. Here in this blog, we will discuss more on this topic. Why should you spy on your competitor’s business? The first thing that you should do is to find businesses that are similar to yours. Following your competitors often helps you to gain more insights into the latest industry trends and helps to generate more ideas for your business. It is always a good idea to know more about the market competition and what your rivals are doing to keep you a step ahead of the stiff competition. Finding the list of keywords that your competitor is using allows you to learn the techniques that authoritative sites use to dominate the search engines. Identifying your competitors: The first step to start with is to identify businesses in the same field and analyze the keywords that they are using to gain ranking. This will help you to understand the strategies that they are using to optimize their websites for the search engines. Determine the keywords: After analyzing your competitors and their keywords, it is vital for you to select the keywords that can drive traffic to your site and also generate more sales. You can start with less competitive keywords as they are quite easy to rank. Track the indexed pages: It is very important to gather as much information for your competitor’s indexed pages. By doing this, you will be able to understand what type of content and key phrases are used in the pages and the methods that they use to draw public attention. Check backlinks: Ranking on the first page of the search engine is never possible without quality backlinks. So, identifying how your rivals are getting those backlinks will help you to adopt ideas that can be implemented on your backlink strategy. SEO and PPC campaigns: It is very important to closely monitor the websites of your rivals and understand their SEO and PPC campaigns. This will help you to choose specific keywords that are targeted and used for paid marketing campaigns. Google alerts: Setting Google alerts is also another means to identify your rival’s keywords. It also helps to discover countless other key phrases that are relevant to your business. You can also measure the performance of the various website by using specific tools and base your SEO campaigns on it. Google keyword planner: It is a popular keyword research tool and is available for free. The most important thing about it is that it shows you the competitor’s ad word keywords. It is fantastic for collecting important statistics like average monthly search volume, keyword difficulty level, the average cost per click and much more. Open site explorer: This is an outstanding tool that is perfect for analyzing the methods and techniques used by your competitors to build backlinks. It offers complete information about the anchor texts that they use and also the domain authority of the sites they are receiving backlinks from. KeywordSpy: This is the first tool that is specifically focused on keywords. With this, you can easily see the daily ad budget, ad positions, click numbers and costs for the ads. You can see the organic and the PPC keywords. SEMRush: This is another tool that has a massive dashboard with tons of information about the site that you enter. You can click the keyword analytics and check the geographic distributions, data for desktop and mobile, specific, organic and paid keyword information. Alexa: This is a reliable and advanced keyword analysis tool. If you want to know what your rivals are doing, then this tool is a must as it offers detailed information about the traffic, keywords and their link building efforts. 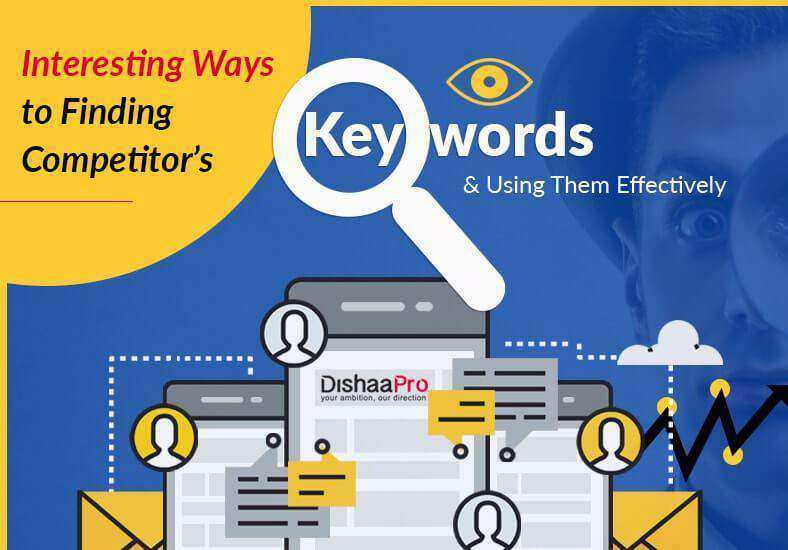 With competitor’s keyword analysis, you can always remain to be more competitive, relevant and most importantly profitable by applying some proven tips. With the online marketplace always evolving, it is vital to adapt and innovate and continuously analyze what others in the same industry are doing. Your constant efforts will help you to keep abreast of the latest trends. Joining the best digital marketing training institute will open up great career opportunities and contribute to having a stable and lucrative job. If you are interested in this rewarding career, then we at DishaaPro can surely help. We are a leading Digital Marketing training institute operating in Delhi/NCR and Bhubaneshwar. All our courses will help you to gain expertise in technique and strategy that various business organizations demand. Enquire Now! Call us today on +91 120 4260552/9870486335 or email us at [email protected] and get your queries and doubts cleared!